Benefits of Wooden Hangers. 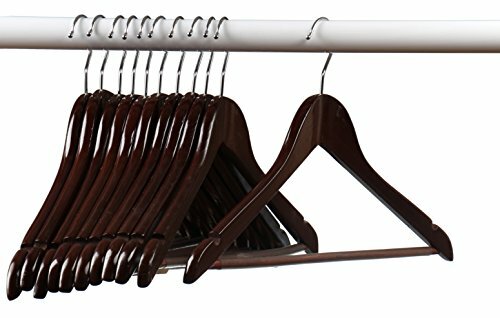 A wooden hanger will ensure that your clothing lasts significantly longer than if you use a wire hanger, especially if the garment has some bulk to it. I jumped on the bandwagon and bought a whole bunch of those super slim, felt covered hangers, which are great if you are hanging up T-shirts or light items. However they did not hold up so well with my heavy winter jackets. That's when a good wooden hanger is hard to beat. I ordered the Home-It 24 wooden hangers and was surprised to see how well made they are. The neck is slightly curved, a design to fit the unique curve of fine suits, so that they retain their shape for years to come. These hangers have small notches that are for hanging up skirts and there is even a non-slip cover for pants.